Siberian cat breed information and advice. Siberian cats are friendly gentleman with a winning personality! Formerly known as the Siberian Forest Cat, Siberians are cheerful, charismatic and cuddly cats who bring so much love to their homes. Wayne Baxter, chairman of the Siberian Cat Club, says: "They are very loving cats; the males are bigger and slightly more docile, whereas females tend to be smaller and bond closest with an individual, and they do things more on their own terms. Either way they make great pets." They are described by breeders and owners as being dog-like in their personalities, as they are incredibly loyal to their owners and run to greet you when you come home. They also like to get into in whatever happens to be going on in the house at the time, whether it's reading the paper with you (by draping themselves across it!) or 'helping' you with your household chores. "They have to be involved in everything; they'll always be either two steps in front or two steps behind you!" laughs Wayne. "But they'll love curling up on the sofa with you while you're watching TV. They're very addictive as well - one Siberian is never enough." Siberians are actually good all-rounders as their sweet natures mean they are great with children and dogs, and even other cats. One of the breed's more unusual traits is their love of water due to their waterproof topcoats, whether it's a running tap, a sink of water or a shower, your Siberian may well find a way to enjoy it - so bear in mind that next time you take a bath, you might find yourself with a fluffy gatecrasher! Siberians are happy being kept as either indoor or outdoor cats, but indoor-only cats will need lots of toys and stimulation to keep them happy. Wayne says: "They are a breed that loves to be kept interested and love to climb so it's to your advantage to have a sturdy, tall scratch post for them to climb." Will a Siberian cat suit my allergies? A long-standing claim is that Siberians' special coats are said to contain less of the FelD1 allergen found in cat dander which makes them popular with cat allergy sufferers. However, the Siberian Cat Club is keen to emphasise that this should not be taken as 100 per cent true and breeders always recommend that you spend plenty of time with a Siberian to determine if this will work for you. The club also points out that claims that males are less 'hypo-allergenic' than females and that certain colours of Siberians, including colour points, black and blue, have more of the allergen FelD1 - these are NOT true. The Siberian is a medium to large cat with a broad chest and a wedge-shaped head, topped off with tipped ears. Siberians have semi-longhaired coats and as mentioned, their top coat is waterproof with a dense, soft undercoat which grows thicker in the winter - a throwback to living through the cold Russian winters. They come in a huge variety of colours and patterns including brown, black, blue, red, cream and white in solid, tabby, colourpoint and tortie - a total count of 124 variations! Their eyes are mostly tones of copper or green. The breed can be traced back to rural farms in Russia and the streets of St Petersberg during the 13th century. The breed became scarce during World War Two but it is thought that the cats that survived the harsh climates did so because of their dense undercoats and top coat, and it was this trait that gave them the name Siberian. They were exported to Europe and the USA in the 1990s, and they arrived in the UK in 2002. 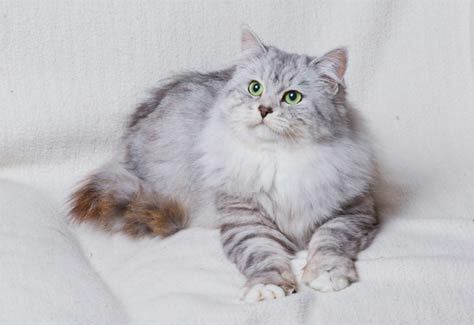 You should expect to pay around the £500 to £600 mark for a pet quality Siberian kitten, maybe slightly more in the south and London, or if they have been neutered, and you may have to wait a while if you desire a certain coat colour or pattern. As with all breeds, look for playful, healthy kittens with shiny coats, clear eyes and ears with clean bottoms. Make sure you see the kittens with their mother, and possibly the father. If you have an allergy, spend plenty of time with your preferred kitten to make sure you are compatible. While there are no known chronic health problems in the breed, there have been cases of Hypertrophic cardiomyopathy (HCM) in some lines, so Wayne suggests doing your research and buying a kitten from a trusted breeder with no known cases of the disease in their lines. There were also some known cases of Polycystic kidney disease (PKD) but there have been no known cases in the UK. Despite their double coats, when it comes to grooming, Siberians don't have a particularly high maintenance grooming regime. As they have seasonal moults in the spring and autumn, a daily comb during this time will keep their coats well maintained and other than that, a comb every other day will keep them looking their best.